Welcome to our online gateway to original artworks, including select print reproductions on paper, canvas, wood, metal and merchandise (such as handbags and headbands) and other handmade-by-the-artist items (such as wood coasters and jewellery). Our products presented here are provided subject to the following terms and conditions. By using this site you agree to be bound by the terms and conditions in effect at the time of your visit. Please read them carefully. #1 Only buy what you love! #2 You’re going to love your artwork even more in person. Prices listed on this site are in Canadian dollars. Payment must be received before order is shipped. Options: Cash, e-transfers, chqs, credit cards, or invoices can be sent through paypal or square. Canadian sales tax is in effect. Tax rate is determined and applied once you enter your shipping address to proceed with a purchase. When ordering an original artwork or any other merchandise that ships directly from the artist there is a 24 hour grace period. It is important to contact the artist immediately. Cancellations beyond the 24 hour grace period result in a non-refundable purchase. Regrettably, we are not responsible for duties and taxes required for international shipping. Shipping to Canada and the US is complimentary on online orders of original artwork available through my studio gallery exclusively. Small works (under 18"x18") are shipped Canada Post, insured. Once your order is shipped we will email a confirmation with the tracking number. Please include your phone number with your order so that, if necessary, the Artist or carrier can contact you. Shipping provided by FedEx and a tracking number will be provided at the time your order is shipped. Please note that we cannot deliver to a PO box so please ensure that you provide us with your actual street number address. If ordering outside of Canada or US additional shipping fees could apply and you will be contacted, or you may contact us in advance at col@colmitchell.com or 705-783-010. Payment must be received before order is shipped. Turnaround time for printed products is between 5-7 days and 7-10 days for facemount to acrylic plus additional time for shipping. Oversized canvases and large orders may take longer to produce. From mid-November to Mid-January the production times may also increase due to the holiday season. Note: Depending on the type of damage It may be possible for me to repair. Let's also have a conversation about it. The purchase of any artwork, print or product does not provide the purchaser with any copyright interest or other intellectual property right in the product. All product and content produced by Col Mitchell such as, but not limited to, original artwork and their digital reproductions, images, text, video, graphics, logos, and button icons, is the property of Col Mitchell or its content suppliers and is protected by Canadian and International copyright laws. All content that is not the property of Col Mitchell is used with permission or is in the public domain. The arrangement and compilation of all content are the exclusive property of Col Mitchell and are protected by Canadian and International copyright laws. © 2019 Col Mitchell All Rights Reserved, except where permission is expressly given. Some information is required for shipping and billing purposes. Upon placing an order, your contact information will be kept for our Mailing List. We will use your contact information solely for that purpose. Your privacy on the Internet is of the utmost importance to us. Your information will NEVER be sold or released to any one or party without your express permission, except as required by law. 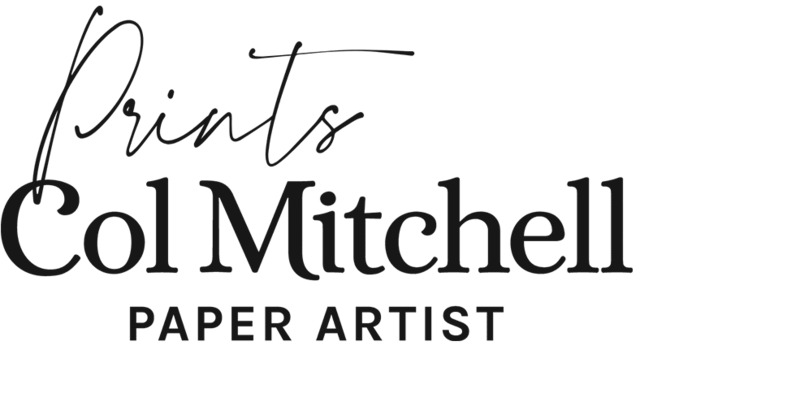 All attempts will be made to make your online experience with Col Mitchell – Contemporary Paper Artist satisfying and safe.